ActiveHybrid X6 and 7, Vision concept car make N.A. debuts. The fuel economy of a microcar, the performance of an M-Series model; the Vision makes its North American debut at the L.A. Motor Show. Showgoers at Los Angeles’ Staples Center will get a good look at three high-efficiency models from BMW, when the 2009 L.A. Auto Show opens, next week. Though first seen at the Frankfurt Motor Show, in September, it will be the first North American showing of the ActiveHybrid X6, ActiveHybrid 7 and EfficientDynamics concept car, all collectively pointing to the various strategies the German maker will use, in the coming years, to cope with demands for significant increases in fuel economy. The challenge facing the automaker is to maintain its reputation for sporty, dynamic handling, even as it meets tough new mileage and emissions standards here and abroad. It’s a challenge that will be particularly difficult for luxury makers, who generally produce larger, more powerful products than mainstream manufacturers, and traditionally rely on a scoff-law approach by defying U.S. regulations and buying their way clear by paying fines. 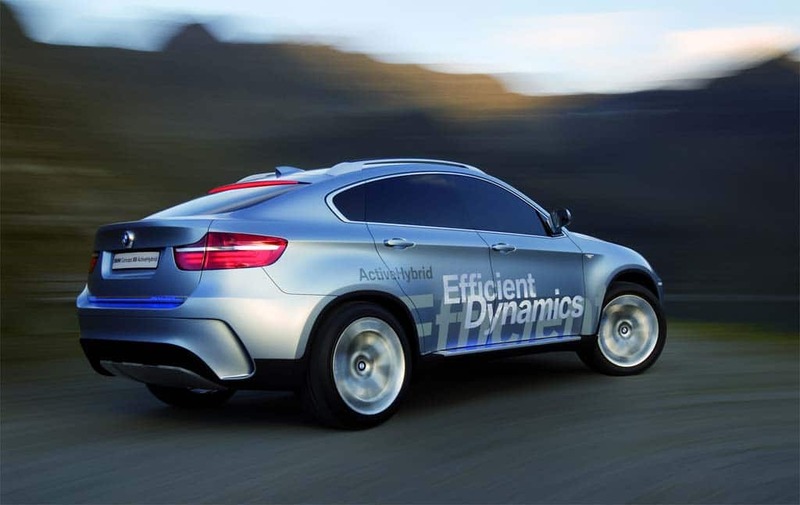 The 2010 BMW ActiveHybrid X6 will reach U.S. dealer showrooms in December. Based on one of the newest member of its Sport-Activity Vehicle line-up, BMW claims the ActiveHybrid X6 not only maintains but actually improves “driving dynamics,” even as it boosts fuel economy by an estimated 20% compared to a conventionally-powered vehicle. It pairs a 400-horsepower twin-turbocharged, direct-injection V8 gasoline engine with two electric synchronous motors, driven by nickel-metal hydride batteries, the combination producing 480-hp and 575 lb-ft of torque. That’s enough to launch the big SAV from 0 to 60, the automaker claims, in 5.4 seconds, and reach an electronically-limited top speed of 130 mph. The gasoline-electric hybrid maintains the standard X6’s intelligent xDrive all-wheel-drive system. The ActiveHybrid X6 will be the first BMW model able to operate solely on battery power, for limited distances at speeds up to 37 mph. The automaker says it won’t have U.S. fuel economy numbers until closer to the vehicle’s North American launch. 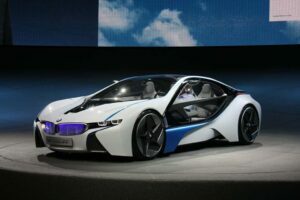 Set for a U.S. launch next spring, the 2011 BMW ActiveHybrid X7 will be the fastest hybrid vehicle in the world, the Bavarian maker claims. 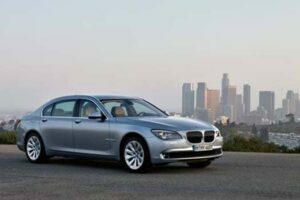 BMW’s ActiveHybrid 7 shares some of the fundamentals with the X6 hybrid, but here, the twin-turbo DI V8 is paired with a single, 3-phase synchronous motor, the combination generating 455-hp and 515 lb-ft torque. The hybrid version of the flagship 7-Series features an 8-speed automatic gearbox. This ActiveHybrid will become the first BMW to use lithium-ion, or LIon, batteries in mass production. With a rated 0 to 60 time of just 4.7 seconds, BMW claims the ActiveHybrid 7 will be the fastest hybrid-electric vehicle in the world. Fuel economy is expected to improve 17 to 18% though, again, BMW won’t have official EPA numbers until near launch. The third LA preview unveils the BMW Vision Efficient Dynamics hybrid, which proved to be one of the star’s of September’s Frankfurt Motor Show. The 2+2 is a plug-in hybrid, designed to let motorists commute or run errands entirely on battery power, but then have the added range of an internal combustion engine for longer runs. With the use of advanced aerodynamics, the maker claims the sleek concept vehicle delivers the performance of an M-Series model, with 0 to 60 times of around 4.7 seconds. Vision integrates virtually all of the various EfficientDynamics concepts, from hybrid power to a stop-start motor. At its heart is a 3-cylinder turbodiesel, with individual electric motors on each axle – which yields all-wheel-drive when operating in electric mode. Overall, they produce 356 hp and 590 lb-ft of torque. But fuel economy, according to the European test cycle, is 62.6 mpg. There are no production plans for the Vision concept vehicle, but the ActiveHybrid X6 reaches U.S. showrooms next month. The ActiveHybrid 7 follows in spring 2010. This entry was posted on Wednesday, November 25th, 2009 at and is filed under Automobiles. You can follow any responses to this entry through the RSS 2.0 feed. Both comments and pings are currently closed.